Monday’s City Council Meeting includes an agenda item requesting Council direction to the Park and Recreation Advisory Board on how to proceed in investigating a site, design and cost for a future skate plaza area. 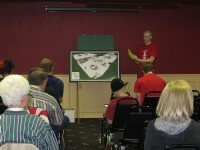 The Northfield Skateboard Coalition presented their findings to date to the NDDC May Forum attendees. We learned that skateboarding is the second fastest growing sport in the U. S., after Ultimate Frisbee, that there are an estimated 500 skateboarders in Northfield, and that enthusiasts and their families from all over the southern Minnesota region travel to the skateparks in Rochester, Edina and Eden Prairie, generating economic activity for those communities. Several audience members wondered what happened to the old skatepark near what is now the Village on the Cannon. Apparently the design was not well conceived and resulted in excessive operating, repair and insurance costs. The Skateboard Coalition has developed a plan in which all elements are under 4 feet tall and therefore doesn’t require fencing, staffing, entry costs, expensive equipment or excessive insurance premiums. The proposed plaza would be constructed of concrete instead of wood and would be much longer-lived. In addition to Monday’s Council Meeting, the Skateboarders have a couple of other important events on their calendars. On Sunday, May 20th, from 8 am to 12:30 pm, it’s an All You Can Eat Omelette Breakfast at the American Legion Ballroom as a fundraiser for the park. Then on Friday, June 1st, there is going to be a demonstration of skateboarding skills and related art in front of and inside of Grezzo Gallery on Bridge Square. Clearly, it’s a big month for the Skateboard Coalition. Pingback: Northfield Downtown Development Corporation » Weblog » Skatepark to be Realized?